Indie Retro News: Cobe 002 Burnout Ultimate - Amiga game ported to the CD32 but does require Fast RAM! Cobe 002 Burnout Ultimate - Amiga game ported to the CD32 but does require Fast RAM! 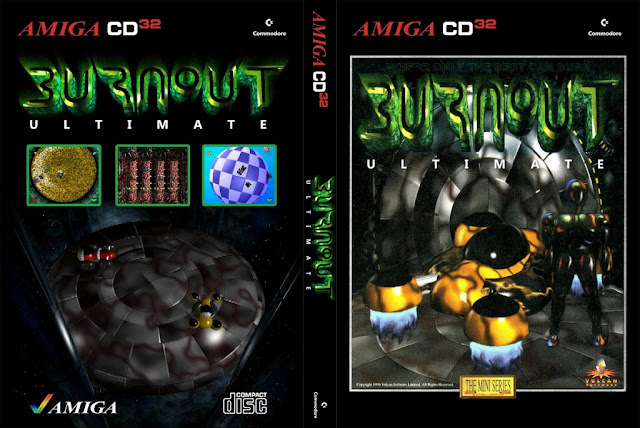 Earok recently gave me the shout out, to let me know that Cobe and Lemming has done another Amiga to Amiga CD32 conversion from a game called ' Burnout Ultimate ', which was first released in 1996 by Vulcan Software. If you've never heard of this game before, that's because it was a game from late in the Amiga's run (part of Vulcan's "MiniSeries" label ) and is similar to a shareware game called Knock Out 2. The game pits you against a number of race drivers in a futuristic setting against each other, as a Battle Royale to knock each vehicle off the main Arena. Graphically Burnout Ultimate is a very nice looking game requiring 2MB Chip-RAM and 6MB Fast-Ram, that was designed by one person Mark Sheeky. The CD32 conversion however wont work as well on a standard CD32 system, and such is the first release on Earok's website to require an expanded CD32, both the brand new TerribleFire expansion and more classic expansions like the SX-1 or SX-32 should work fine. As for the game itself, there are also four custom made arenas included, three of them have been featured on Aminet but the fourth is exclusive to this disc.